You want big, room filling sound without having to sacrifice valuable room space. 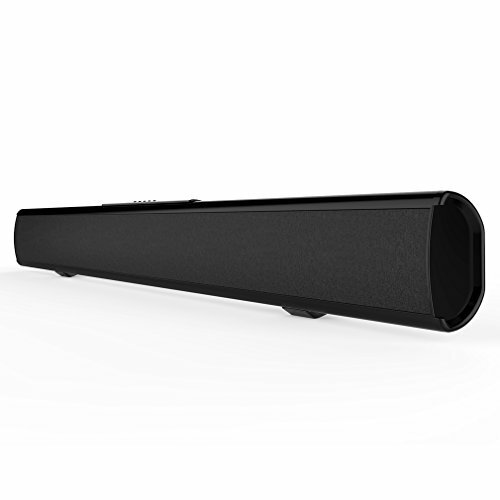 That's why meidong engineered the KY-2022 sound bar to deliver clear, spacious sound in a slim, space-saving package. Every cubic inch of this speaker is packed with technologies that bring your music and movies to life in a big way. It starts Inside with custom-shaped speakers that keep the profile low and pump out big sound. Quieter technology virtually eliminates distortion so you hear surprisingly Deep bass. Adapted audio room calibration ensures the sound bar sounds the best it can in the space you put it, while waveguide technology makes you believe you're hearing sounds where there are no speakers. on the outside, the glass top and perforated wrap-around metal grille make the sound bar look as good in your room as it sounds. Bluetooth technology are built in, so you can wirelessly stream music any way you prefer. REMOTE CONTROL OR BUTTON CONTROL- Dual operation of bluetooth sound bar which offers high grade convenient one button control and a remote. We provide 18-month warranty and quick response & friendly customer service.